Wow I'm actually getting married. It's becoming a reality now. And I was keep, you know, thinking about the bride, guigui, too. If she's gonna like it or if she's gonna like that? Our relationship has gone to a phase where we are always there for each other. It's what like, you know... I don't know, Tom and Jerry... kind of. and she did't really fit into my life style before. we are molding into a couple. Today is the wedding day. From today to whenever it may be…Let us have fun and fill our memory with happiness. I love our marriage. Let's make the best ever. I'll do my best. Out of the marriage. Let's make the best ever. I'll do my best. 但我聽了一下. 我比較傾向I LOVE OUR MARRIAGE. 其實這也代表了他強調他愛這個婚姻. 所以我解釋為他說這句表示他不想把它當成假想結婚 蜜月這幾天澤演太感人了. 我感覺他都是在說他自己真正的想法. 也想把真心傳送給鬼鬼. 如果只是拍戲. 小黑屋不用講得這麼認真. 但他每句話都講得很認真. 我又去看了 ep2的生活公約 ,鬼鬼明明寫著出門的時候一定要手牽手,但 oppa除了在濟州島那邊有牽手和 ep1怕鬼鬼跌倒而牽手,帶鬼鬼趣市場買菜時根本就沒牽,魔羯座的oppa真的太ㄍㄥ了!我發現玉澤只敢在室內兩人一起的時候才敢牽手,或許有偶像的包袱所以不敢大挺廣眾下和鬼鬼牽手,我只能解釋oppa是為了保護鬼鬼而刻意不去牽手了!! Thank you for another wonderfully written article. I really enjoy reading it. From Time Limited True Hearts to Endless Possibilities, I am truly touched by this beautiful couple. We cheer for them, we laugh with them, we cry with them, we worry for them, we are so move by them. Their aurora is undeniable because love is undeniable. I watched some Gui Gui you tube videos recently and my hearts just aches for this girl. I am so moved because even if life dealt her some hard cards, she is still able to emerge on top of things and appears so cheerful. When I re-watch the first episode, I was touched when she was asked what she expected out of this marriage. And she said she hopes she could bring some fun and happiness in his life. When asked about her expectations in wedding photos, she would say she was excited but she would not put high expectations in things and just hoped things would go smoothly and she would be happy. I guess what I am trying to say is that a take it easy attitude and a give more than take attitude is another display of her endearing character. Loneliness can kill. How ironic is it that despite the fact that she has so many fans and supporters we could still feel her pain and loneliness and understand that behind her happiness and cheerfulness there is the fear of loneliness. For the two of them to open their hearts and simply be there for each other is so touching. 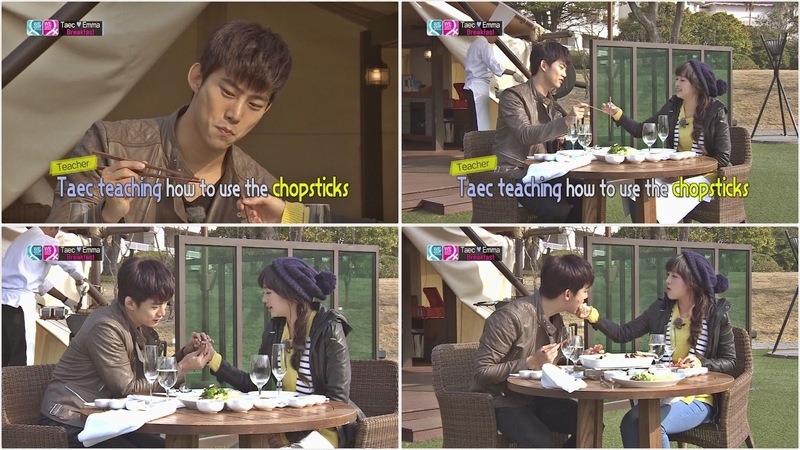 The sincerity we could feel from Taec's words. Just a simple I would do my best to make you happy moves me too. Do as promised is one of his ten love commandments. He does not always have the prettiest words or fancy compliments but I believe he will do what he promised. They are simply beautiful and love is simply beautiful. I like what you said,"Their aurora is undeniable because love is undeniable. " I think that is why we are so hooked by their loving interactions, because that reminds us such pure and simple emotion still exists. I have watched some early videos of Gui Gui, too. Before that, I have heard about her early career life and unfortunate childhood. I can see that she is a lonely girl. Luckily, she has many good friends around her. They somehow fill the emptiness which her family left, but not completely. I really hope that she will find someone who can sooth her uneasiness and cure her loneliness. At this time, I do hope that the person will be Taec Yeon. Like you said, he is not so good at saying beautiful and sweet things to girls, but he is definitely the man you can count on. I hope sooooo much as well that both of them are right the soul mates for each other from whom they can get the happiness they lack and desire to fill the emptiness and hole in their hearts, along with the cure for their loneliness deep inside, which is behind their everyday masks for pretence and self-protection!!!!! Let all of us pray for them that they would seize this only one great opportunity to get to cherish and support each other for the rest of their lives!!!!! Highly wish they could mould their two lives into ONE!!!!! 照映出人內心潔淨無暇的純真 :-) i like this one! 我有想過喔. 他們真的拍過很多相片. 但到底相片是歸屬於誰的. 有時用鬼的手機. 有時用澤演的. 有時用samsung相機 (這相機不是是製作單位的還是澤演或是鬼個人帶去的). 不知道這些相片最後都怎樣處理. 還是每個人都會有完整一份嗎. 還是拍在誰的手機就誰的了還有結婚相片. 他們真的每個人都會有嗎. 還是歸屬於製作單位. 這些結婚相片本來拿回去了會不會太奇怪. 萬一之後各有了對象????? 常常聽到有人說澤演是魔羯座必較不浪慢.甚至PD說他很安靜內向.所以配個活潑得給他 但最近看綜藝節目都沒有這方面的感覺. 覺得他還蠻適合綜藝咖. 他在團體裡算是比較敢瘋的人. 為什麼大家會有這樣的印象呢. 他果然有種神秘感喔. 後來比較一下過去的綜藝節目. 的確他在別人節目. 話不是很多. 相對安靜. 但可能在自己的2PM SHOW. 就比較瘋一點. 我覺得愛情的力量有改變他. 他的確為鬼鬼做了些妥協. 比如接近動物. 花絮裡也說了其實他真的很不喜歡. 但鬼鬼歡. 他還是去嘗試了. 你看了EP 11 嗎. 最後結尾的小黑屋訪問澤演問覺得今天一天感覺如何. 他回答比起喜歡的感覺絕應該愛的感覺更多. 怎麼聽起來有點文不對題啊. 到底他回答的英文全文是甚麼. 可以幫忙一下嗎. 可能期望太大. 失望就越大吧. 從上個星期五期待到現在. 這集沒有想像中那麼多好玩或驚奇的點.也許又是剪輯的關係吧. 鬼鬼也盡量表現了. 礙於語言跟要給澤演面子. 可能沒辦法表現得那麼真實自然. 既然一開始沒做好表情管理. 看到尼坤那一臉的興奮. 就表現出自然的本性好了. 但後來她變得妞捏了連看尼坤都不敢. 總之還是希望她自然點更能顯出她的魅力. 這樣驚喜點會更多吧. 只要最後有說結婚了. 現在以OPPA為重就好了.也給了OPPA面子就好了. 之前就自然地與尼坤互動. 有點粉紅刺激OPPA也好. (尼坤最後訪問不也說了他有點失望. 感覺鬼鬼沒有那麼喜歡他吧. 準備的話沒機會說) 旁觀著總是能客觀地覺得可以表現得更好. 不過我想鬼鬼都盡力了. 不過這集還是讓我們知道了一些點. 俊昊說澤演一有時間就會提鬼鬼. 表示私底下應該是很喜歡鬼鬼的.還有就是最後的訪問 (目前解讀是說他覺得比起喜歡鬼鬼應該是愛的感覺更多是嘛). 不過我發現一個點就是光熙來時問他BOBO 了沒. OPPA 的表情真的很逗. 害羞的大男生. 沒錯. 一開始覺得沒如預期. 好多地方很尷尬. 但多看了幾次也就自然了. 我也看了好多次啦. 就好比有時聽到鬼說的英文. 有時替他覺得尷尬但聽多了也就順了. 可能只能有約25分鐘的內容真的太難剪了吧. 我覺得參家我結真的替2pm爭取了很多新的fans. 所以它們這次台灣的唱片應該會賣得不錯. 25分鐘的片子一直反覆看. 有時又找之前的看. 這段期間好像都無法去看其他片子. 總是想到就回味一下. 所以下集應該就是合唱了. 以為是澤演日本演唱會那首. 沒想到不是耶. 但一開始有點像. 也是澤演做的. 真不賴. 我一直感覺越到後來幾集真的都有點為下車後繼續戀情做準備的感覺. 都越來越敢表達感情. 剩下4集是要怎麼辦啦. 很失落. 但也許這樣才能慢慢恢復比較正常的生活吧. 前幾天鬼的微博.很曖昧. 大家又當起福爾摩斯猜測它們的行蹤. 大家真是快瘋了吧. oppa是越來越多事了. 又要拍電視劇. 還有空念研究所嗎??真的見面好難喔. 對啊. 每天留言的人這麼多. 很快就被淹沒了. 有時看鬼的FB留言要刷很久. 聽說微博更多. 根本無法看起. 不知道他們兩人私底下是不是真的有聯繫喔? 大家都好關心他們. 所以它們的微博.推特每天都好多人關心. 今年2pm 鬼鬼也是越來越火紅了. 如果2pm會去大陸發展他們應該就會很認真地學中文. 就像他們去日本發展一樣. 他們的日文都算不錯. 好像尼坤也要演中文戲耶. 其實蠻多韓星都到大陸拍戲的. 那鬼鬼跟澤演也可以合作一部戲啊. 應該也有市場吧. 問你喔之前你提過百度網盤有可以下載的地方. 我看到了. 但那是在百度吧鬼澤夫婦裡有人貼的連結. 請問你知不知道如果沒有人貼上連結. 那自己怎麼進去找或是搜尋有沒有想要下載的資料. 因為我貼了連結進去之後想要試試搜尋有沒有其他想要的資料但沒成功所以問問. 還是只能等人家貼連結才能下載? 另外鬼鬼在求婚時說oppa有時會忘記一些事. 我猜是不是義大利麵的問題啊. 那天在餐廳是吃義大利麵. 但鬼鬼說他不喜歡番茄醬. 那時oppa問他說那PISA OK 嗎. 鬼鬼說可以. 又問那義大利麵呢. 鬼鬼回答說不喜歡. 但在餐廳還點義大利麵.